Ask the average major-leaguer if there was a particular at-bat when it all started to click for him and he’d probably be hard-pressed to come up with the answer. Bob Bailey, on the other hand, would be able to tell you the date, the location, the inning, the pitcher, the pitch, and even the Canadian holiday on which it took place. It was easy to find Bailey’s name and photograph in southern California newspapers in 1960 and 1961, such was his athletic prowess at Long Beach’s Woodrow Wilson High School. As a shortstop, he won back-to-back batting titles his junior and senior years, and was voted player of the year on the all-city team both seasons. He also won consecutive prep passing titles as quarterback of Wilson’s football team, but even though Bailey received football scholarship offers, at is heart he was a baseball player. This being the era before baseball’s amateur draft, which was instituted in 1965, Bailey could sign with any team he wished. It wasn’t a matter of if he would sign; the only questions were with whom and for how much. Media speculation ran high as to which team would get Bailey’s autograph on a contract, which he was eligible to sign the moment he graduated high school; scouts drooled at the prospect of signing him. Pittsburgh didn’t waste any time with their hot commodity, dispatching him to their Class A affiliate in the South Atlantic League, the Asheville Tourists. He had a less-than-auspicious debut, going 0-for-4 and committing an error at shortstop. His struggles continued early on; at one point he had endured a 4-for-45 slump. He ended up batting .220 with nine home runs and 31 RBIs. For the Pirates, those numbers, including a .402 on-base percentage, were good enough to catapult Bailey past Double-A and on to the AAA Columbus Jets of the International League for 1962. It seemed that no matter what he did, the local press wasn’t going to let Bailey forget his huge signing bonus. Even when he announced his engagement to high school sweetheart, Karen Crozier, the Long Beach Independent Press-Telegram read: “Bonus King to Wed.”5 The couple married on November 18, 1961, and, in 2016, were looking forward to their 55th anniversary. Nonetheless, he responded well, because the difficulties of his first year as a professional were nowhere to be found in 1962. At Columbus he hit .299, with 28 home runs and 108 RBIs and played solidly at third base.7 The Pirates called Bailey up in September, and he made his major league debut on September 14 against the San Francisco Giants at Forbes Field, going 0-for-4 with two strikeouts. Bailey got his first major league hit the next day, a two-run triple off Jack Sanford, the runner-up in that year’s Cy Young Award voting. On September 20, he celebrated being named International League Rookie of the Year by driving in the tying and winning runs with a two-out walk-off double in the ninth to give Pittsburgh a 4-3 win over Cincinnati.8 Overall, he got into 14 games, batting .167, with no home runs, six RBIs and 10 strikeouts. If Bailey had any doubts about being an everyday player in 1963, they were erased on November 28, 1962, when the Pirates traded Don Hoak, incumbent third baseman and a fan favorite from the 1960 World Series champion team, to Philadelphia. With Hoak’s departure also went any hopes Bailey may have had about not facing high expectations. There is no record of whether Murtaugh chased those “competent” men with a baseball bat after the 1963 season ended, but it would have been understandable if he had. The Pirates limped to a 74-88 record and an eighth-place finish in the 10-team National League. Bailey’s natural ability wasn’t enough, as he hit only .228, with 12 home runs and 45 runs batted in, while playing in 154 games. His defensive record was a mixed bag; he was second in assists among NL third basemen (332), but was also third in errors committed (32). That’s not to say he didn’t have his moments. He was clearly the star of the Pirates’ home opener on April 9 against the Milwaukee Braves. He hit his first major-league home run off of Lew Burdette in the seventh, then, with the score tied 2-2 with two out in the bottom of the ninth and Bill Virdon on first, he beat out an infield dribbler that moved Virdon to second. Virdon scored the game-winning run on a single by pinch-hitter Ted Savage. Part of Bailey’s difficulties stemmed from having to play his home games at Forbes Field, an old-time ballpark with dimensions so deep that the outfielders had to car-pool from the dugout to their positions. Bailey, a dead-pull right-handed hitter, had to contend with a 365-foot left-field line (compared to 300 feet down the line in right) and a center-field wall 457 feet away. Bailey had to adjust his hitting style to be more effective, and did so in his sophomore season by trying to make better contact and hitting more up the middle instead of swinging for home runs. Bailey’s “soph sizzle” cooled a bit through the rest of August and September, but for the year all his offensive numbers, except for home runs, were better than in his rookie year. He batted .281, with 11 home runs and 51 RBIs. His OPS was .740 (.632 in 1963), and while his walks were down, he also had fewer strikeouts (78, compared to 98 in 1963). Naturally, bigger things were expected for 1965. Bailey could hardly have started the 1965 season in a more spectacular fashion. Now batting fifth in new manager Harry Walker’s order, he hit a walk-off home run off future Hall-of-Famer Juan Marichal leading off the bottom of the 10th inning to give Pittsburgh a 1-0 victory on Opening Day. Alas, that dinger was not a harbinger of things to come. He did have some highlights, including a home run off Sandy Koufax at Forbes Field on July 11. He hit his first major-league grand slam off Cincinnati’s Sammy Ellis on July 20 (the same week his first son was born), and hit a three-run inside-the-park homer on August 26, when Giants’ right fielder Cap Peterson fell down chasing a Bailey fly ball. Overall, though, his numbers were slightly down from 1964; he batted .256, with 11 homers, 49 RBIs and a .692 OPS. By the time the 1966 season rolled around, newspapers had long since stopped calling Bailey a bonus baby and instead referred to him simply by name. It was now clear to them and to Pirates’ brass that he wasn’t the second coming of Pie Traynor, as they had hoped.15 For the first time in his career, Bailey spent time on the bench, appearing in a number of games only as a pinch-hitter. Even though he got hot in August, trade rumors had begun. He finished 1966 with 13 home runs, 46 RBIs, a .279 average, and an .807 OPS. His defense at third wasn’t exceptional, either. Those days weren’t to come in Los Angeles. After practising at first base during spring training, Bailey started in left field and hit seventh for the Dodgers on Opening Day at Cincinnati’s old Crosley Field. That game gave an indication of how things would go during Bailey’s time as a Dodger; while turning to go after a deep fly ball hit by the Reds’ Leo Cardenas, Bailey headed up the left-field terrace and fell flat on his face. Later, he struck out to end the game as the Reds cruised, 6-1. Things didn’t get much better for him from there. Dodger Stadium wasn’t welcoming to a right-handed pull hitter and Bailey’s numbers showed it. He hit .227 in 1967 and again in 1968, and totalled 12 home runs—one less than he hit in his last year with the Pirates in 1966—and 67 RBIs for the two seasons. Even a return to third base—the Dodgers had traded second baseman Ron Hunt during the off-season and moved incumbent third sacker Jim Lefebvre back to his natural position in 1968—didn’t help. The Dodgers didn’t protect Bailey in the 1968 expansion draft, but after neither Montreal nor San Diego selected him, they sold Bailey’s rights to the Expos on September 21, 1968. 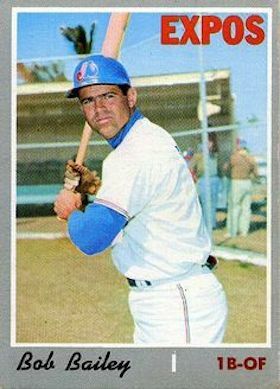 Bailey started Montreal’s inaugural season batting fifth and playing first base for manager Gene Mauch. He got on the fans’ good side by driving in two runs during the team’s first game at Shea Stadium, which the Expos won 11-10. Nine days later, April 17, 1969, was historic for the Expos’ as starter Bill Stoneman no-hit the Phillies at Connie Mack stadium in the franchise’s ninth-ever game. For Bailey, though, there was wasn’t much to celebrate as he broke his ankle in the second inning. He was on the shelf for more than a month and missed 24 games. Nonetheless, he remained the team’s regular first baseman, and although he hit only nine home runs, he did up his average to .265 and drove in what was then a career-high 53 runs. Bailey’s 1970 Montreal season began with the ridiculous and ended with the sublime. Mauch wanted someone to keep the benches warm at chilly Jarry Park and chose Bailey for the job; he saw duty almost exclusively as a pinch-hitter in the early going, and by May 16 was hitting only .125 without a home run or RBI. Then it all changed. In one game. In one at-bat. On one pitch. The game that saw Bailey begin producing as had been predicted for him took place on May 18 during an afternoon game on the Canadian holiday of Victoria Day. Every one of Jarry Park’s 29,184 seats was occupied, and another 2,500 fans jammed in and stood to watch the Expos play the reigning world champion New York Mets. With one out and the bases loaded in the bottom of the ninth of a 4-4 game, Mauch sent Bailey to the plate hoping for a sacrifice fly to score Adolfo Phillips from third against Cal Koonce. Instead, Bailey hit his third career grand slam.18 Unlike the other two, it spurred him into becoming one of the National League’s most feared power hitters. That Victoria Day home run was the first of 28 he would hit on the season--more than in his previous three campaigns combined--in only 352 at-bats, with 84 RBIs, a .287 batting average, and a 1.004 OPS. Bailey’s hitting from the right side meant that left-handers could no longer chalk up an automatic “W” when they faced the Expos, who heretofore had relied on Rusty Staub and Ron Fairly—both left-handed hitters—for extra-base power. After starting 2-11 against southpaws in 1970, Montreal finished a respectable 29-30, thanks in large part to Bailey’s power surge. Bailey’s 1971 season got off to an even slower start than usual. At the end of April he was homerless and batting .160. He got hot again as the weather warmed up, and while his home run total was down to 14, he did drive in 83 runs to go with a .251 batting average. He also performed an unusual defensive feat, tying a major league record by recording two outfield assists in the same inning. In fact he did it twice, on May 5 against Houston and September 6 against the Mets. After a 1972 season where he batted only .233, with 16 home runs—including 12 on the road—and 57 RBIs, Bailey rebounded to have another strong season in 1973. This was the year of the “National League Least,” when the Mets won the East Division with an 82-79 (.509) record. The fourth-place Expos (79-83, .588) were in the race right up until the last week, due in part to a significantly better season from Bailey. He hit .273 with 26 home runs and a career-high 86 RBIs. The highlight of his season was the Third of July fireworks he set off at Jarry Park—two home runs, seven RBIs and four standing ovations—as the Expos put some Canadian content on the Mets with a 19-8 thrashing. Bailey had one last hurrah in 1974, with a .280 average, 20 home runs and 73 RBIs, and had 100 walks for the only time. But his career began its inevitable decline on March 30, 1975, when he was hit on the hand in a spring training game by a pitch from Houston Astros pitcher Jim York. The resulting broken bone caused him to miss Montreal’s first 13 games, and he never got on track after that. He didn’t play regularly all season, and wound up with only 227 at-bats for the year. Not surprisingly, the Expos traded the fading 32-year-old to Cincinnati for pitcher Clay Kirby on December 12, 1975. Bailey overcame these problems, and he and Karen moved back to Long Beach in 2009 to be nearer their three children, 12 grandchildren and eight great-grandchildren. The family suffered a tragedy in 2012 when one of the granddaughters died of Sudden Infant Death Syndrome. To cope with the loss, Bailey began reading the Bible for a half-hour every day. Despite the setbacks in his life and his unfulfilled expectations in baseball, Bob Bailey considered himself a blessed man. He died at the age of 75 on January 9, 2018. The author wishes to thank Bob Bailey for being so generous with his time. In addition to the sources listed in the Notes, the author used Baseball-Reference.com, Ballparks.com, HardballTimes.com, Retrosheet.org, and the following newspapers: High Point (NC) Enterprise, Union (PA) Morning Herald, Gettysburg (PA) Times, Orange County (CA) Register, and Pasadena (CA) Independent. 1 “‘Life with Father’ Pays off with Talent for Buc Infield,” Bristol (PA) Daily Courier, June 4, 1963, 15. 2 Telephone interview with Bob Bailey, April 7, 2016. 3 George Lederer, “Wilson’s Bailey Expected to Command $100,000 Bonus,” Long Beach (CA) Independent, December 3, 1960, D-1. 4 Hughes had also signed Bailey’s father to his minor league contract. 5 “Bonus King to Wed,” Long Beach (CA) Independent Press-Telegram, October 1, 1961, 27. 7 He shared the 1962 International League RBI crown with Pancho Herrera of the Buffalo Bisons. 8 He was also named International League Player of the Year after the season. 9 Joe Reichler, “Pirates’ Bob Bailey Billed as Rookie-of-the-Year in 1963, Indiana (PA) Gazette, January 7, 1963, 27. 10 Harry Grayson, “Bailey Must Carry Load for Pittsburgh—Murtaugh,” Hanover (PA) Evening Sun, February 4, 1963, 8. 11 Walter L. Johns, “Pitching Best Bet For Pirates; Weak Hitting Still Big Problem,” Warren (PA) Times Mirror,” March 6, 1964, 21. 12 “Better Showing Aim of Bucs’ Bob Bailey,” Tyrone (PA) Daily Herald, March 27, 1964, 6. 13 Bailey had been as low as .264 on July 8. 14 Delaware County (PA) Daily Times, August 4, 1964, 4. 15 Traynor was a Hall of Fame third baseman for Pittsburgh from 1920-35 and again in 1937. He also managed the Pirates from 1934 through 1939. 16 Lester J. Biederman, “Where There’s a Will’s There’s a Way,” Pittsburgh Press, December 2, 1966, 74. 18 He hit his second on September 19, 1966, off Frank Linzy of the Giants. 20 Ian MacDonald, “Bailey: 7 RBIs and 4 Standing Ovations,” Montreal Gazette, July 4, 1973, 29. 21 In the bottom of the seventh, Bailey struck out as a pinch-hitter in his last major league at-bat.